Well, that was worth the nearly 10 seasons of waiting. 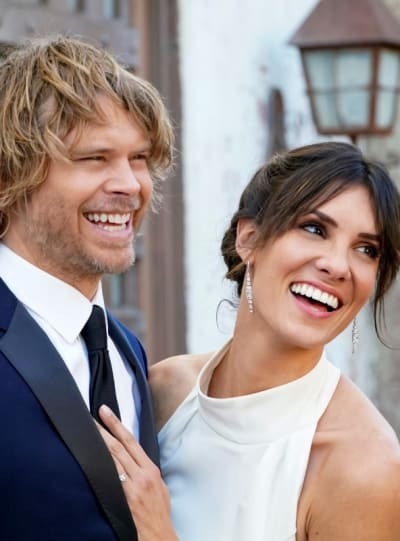 Capping what had to be one of the slowest burns ever, Kensi and Deeks finally got married on NCIS: Los Angeles Season 10 Episode 17. 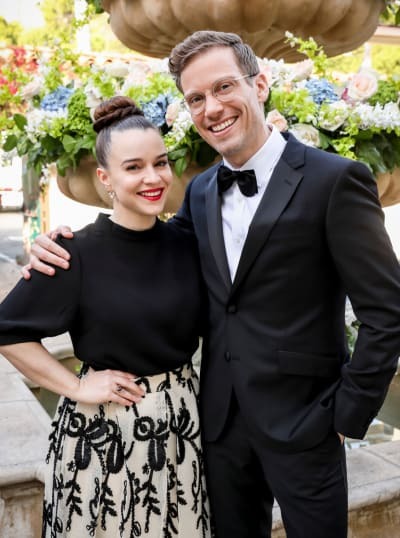 Yup, after more than four seasons as a couple and a two-year engagement, the couple has tied the knot! Hell, Deeks even found a second career faster. But, as Kirkin, and Shakespeare before him, pointed out, the course of true love never did run smooth. That sums up Kensi and Deeks' relationship perfectly. That was certainly the case on Kensi and Deeks' wedding day. And did anyone expect it to be any other way? Of course, there were pre-wedding jitters. I expected those from Deeks. I loved how Otis's bark warned Sam about an intruder, who not surprisingly was Deeks running on hyperactive energy. Apparently, it had finally dawned on Deeks that he wasn't worthy of Kensi, which hasn't exactly been a secret. 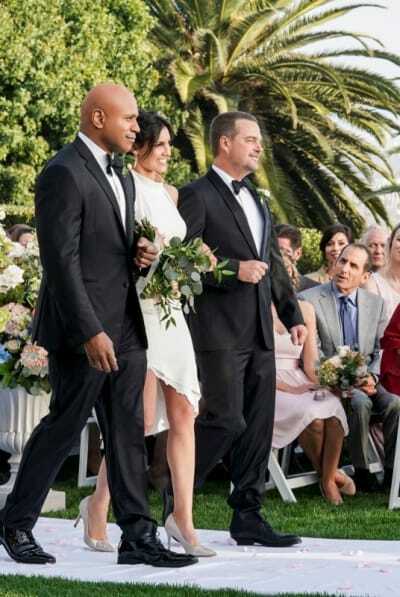 Sam and Callen bolstered him by agreeing with that statement but bowed to Kensi's decision to marry Deeks anyway. Then, as if Deeks didn't need further distractions, Kirkin showed up to convince "his" Marty to run away with him. Naturally. Kirkin is well-meaning but delusional. So, that distraction seemingly averted, Deeks remembered "The Box." You recall the box which Kensi gave Deeks years ago to be opened on the day of their wedding. The box which he had lost all track of and now was looking for feverishly? Thank God for Nell. Kensi had had the foresight to make arrangements with Nell so that Deeks would end up in the right place at the right time, where he would never have gotten if left to his own devices. Kensi giving Deeks her treasured possession, her father's wedding ring, and her explanatory letter were touching, even if it did, once again, send Deeks spiraling in self-doubt. Surprisingly, Kensi was having her moment as well. But hers was more getting away from her smothering mother and friends. It was heartwarming when she and Roberta had a heart-to-heart talk before all the action started. 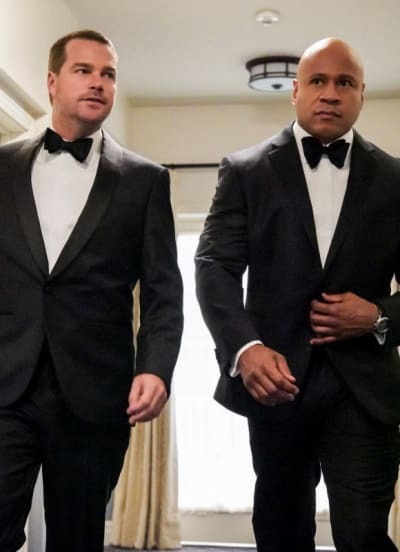 This being NCIS: Los Angeles, "action" doesn't mean the wedding ceremony and the reception. It means Russian mobsters injecting themselves into the entire event. I think Kirkin was determined to give Marty every chance to remember the good times they had had together so that he would call the whole thing off. Kirkin arranged a fake kidnapping by "Pliers" Baroni, a mobster/actor. Only in Los Angeles. You don't get those kinds of hyphenates on NCIS: New Orleans, do you? There it's Special Agent in Charge/bar owner. Kirkin's grand plan was to see who wanted to fill the power vacuum in his organization after he got kidnapped, so he knew who he needed to terminate. That seemed like a solid plan until he turned up at the wedding. 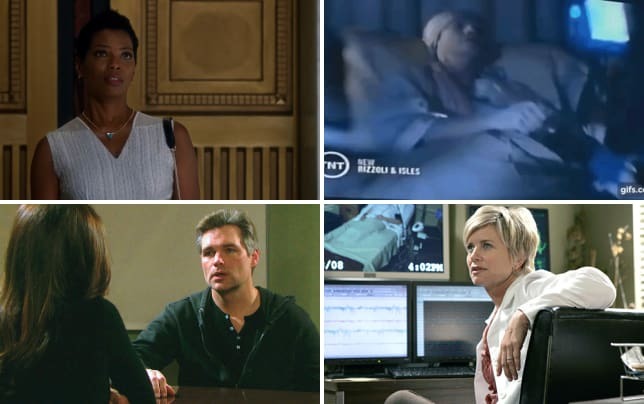 Since his infatuation with Deeks was well known, those planning a coup showed up there also. My favorite moments were watching the Nellverine in action. First, she grabbed Kirkin's face so that he could understand why he needed to disappear. Then she knocked out two thugs with a fire extinguisher, twice the number that either Sam or Callen handled. That's why I want her in the field more often. She brings a certain ferocity to the action. Eric showed that he's not quite ready for fieldwork. After telling Rogers that he wanted to become a special agent, Eric got knocked out after admittedly disarming one thug. Then Kensi took out another for him. And frankly, his welcoming the support crew from San Diego to Ops wasn't his finest hour. He didn't want to share his toys. 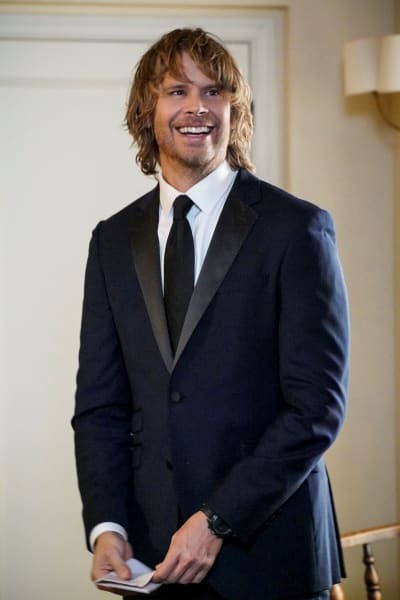 Deeks did his best to keep the whole Kirkin debacle away from Kensi. But when Kirkin walked into Kensi's suite, admiring her dress before jumping out the window, that was no longer possible. Another amusing moment was Kensi and her bridal party attacking the thugs who invaded her suite after Kirkin. Granted, other than Kensi's sleeper hold, they weren't very effective. But it was a hilarious visual. It was great to finally meet Kensi's friends who had been mentioned so often in the past. I still couldn't tell you who was who. Who was pregnant, for example? Kensi's remodeling her wedding dress was just so Kensi. Function over form, all the way. But the highlight had to be Hetty's return, as she ran down the last thug with a borrowed car. Then she turned around and officiated. What a dual threat! And of course Hetty wouldn't admit where she'd been, to keep her team ignorant and safe. Maybe we'll find out in the future, but probably not. The next question is whether Hetty is back for good. Since Rogers was featured in the trailer for next episode, I'm guessing not. But there had better be some kind of explanation upcoming. This revolving leadership has gotten old fast. It beats having Mosley there, but it needs to be over. To revisit the Kensi/Deeks relationship, watch NCIS: Los Angeles online. How did you enjoy the wedding, and was it worth the wait? Were you glad to have Hetty back, even if it's short-term? 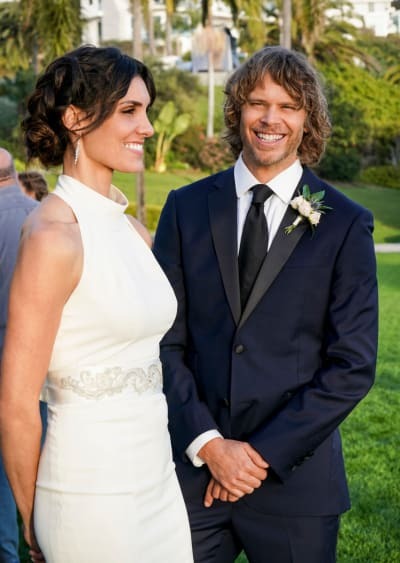 Deeks: I love you guys. Sam: We like you too. Permalink: We like you too. Deeks: But what if I'm not worthy? Callen: That has been obvious since Day 1. Permalink: That has been obvious since Day 1.